Welcome to our website dedicated to the rock ‘n’ roll legend Gene Vincent. 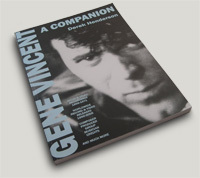 Here you can find full details of our book GENE VINCENT A Companion, the most complete and detailed resource of information on Gene Vincent’s recorded legacy. You can buy a copy on-line for prompt dispatch to you, and you can keep your copy updated by noting corrections and additions to the Gene Vincent sessionography, discography, bibliography, and other information in the book. Add us to your Bookmarks/Favorites and come back regularly, or subscribe to our Newsfeeds or Emailing list. We hope that you will also enjoy the wealth of other information relating to Gene Vincent and The Blue Caps to be found here. The website was created for us by the multi-talented Nikki Pugh. This latest book incorporates and updates all the information in Derek Henderson's Gene Vincent A Discography (1998), adding a number of new features. Full details and purchasing information.